Engineers from the University of Pennsylvania (Philadelphia, Pa.) demonstrated an ultrathin and ultralight equivalent to corrugated paper cardboard composed of aluminum oxide film that is only tens of nanometers thick and is 10,000 times as stiff as a solid plate of the same mass. According to a report from the university, a square centimeter of the nanocardboard, as the engineers termed it, weighs less than a thousandth of a gram and springs back into shape when bent in half. Researchers created the sandwich structure of the nanocardboard to reduce overall weight without sacrificing strength. While this type of structure is ubiquitous at the macro-scale, cardboard, doors, and numerous other products use this type of composition, developing it at the nanoscale required help from the Singh Center for Nanotechnology (Philadelphia, Pa.). A basket-weave pattern with slit-shaped channels in alternating directions provided the necessary strength and resistance to wrinkling. Unlike actual cardboard, the nanocardboard is also resilient, bouncing back after being bent. “The unique mechanical and thermal properties are critical for nanocardboard’s potential uses from microrobotic flyers to thermal insulators in microfabricated energy converters, as the material would need recover its shape regardless of what deformations or temperatures it goes through,” the article added. “Corrugated paper cardboard provides an everyday example of a lightweight, yet rigid, sandwich structure. 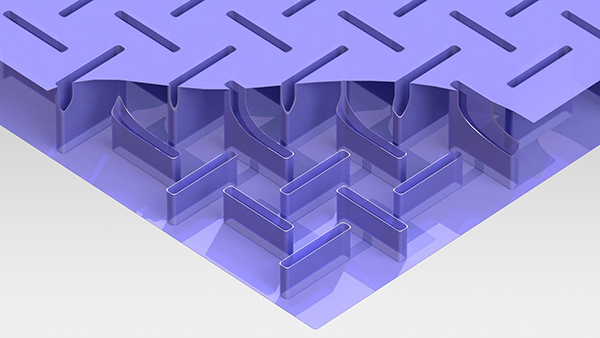 Here we present nanocardboard, a monolithic plate mechanical metamaterial composed of nanometer-thickness (25–400 nm) face sheets that are connected by micrometer-height tubular webbing. “We fabricate nanocardboard plates of up to 1 centimeter-square size, which exhibit an enhanced bending stiffness at ultralow mass of ~1 g m−2. The nanoscale thickness allows the plates to completely recover their shape after sharp bending even when the radius of curvature is comparable to the plate height. “Optimally chosen geometry enhances the bending stiffness and spring constant by more than four orders of magnitude in comparison to solid plates with the same mass, far exceeding the enhancement factors previously demonstrated at both the macroscale and nanoscale.